Last Ohio stop on the tour! Arlo Guthrie is on an 18-month North American tour to celebrate the 50th Anniversary of the event that inspired the seminal song, “Alice’s Restaurant Massacree.” A playing of the song “Alice’s Restaurant” has long been a Thanksgiving tradition for us and we’re happy to see Arlo will perform his most prominent work in its entirety at each stop on the tour. Guthrie will also present material from throughout his career during the jaunt. Arlo’s band for the tour includes Terry Hall (drums), Bobby Sweet (guitar, vocals), Darren Todd (guitar), and his son, Abe Guthrie (keyboards). Each show is also curated with a special multi-media presentation featuring previously unseen images from the Guthrie archives. 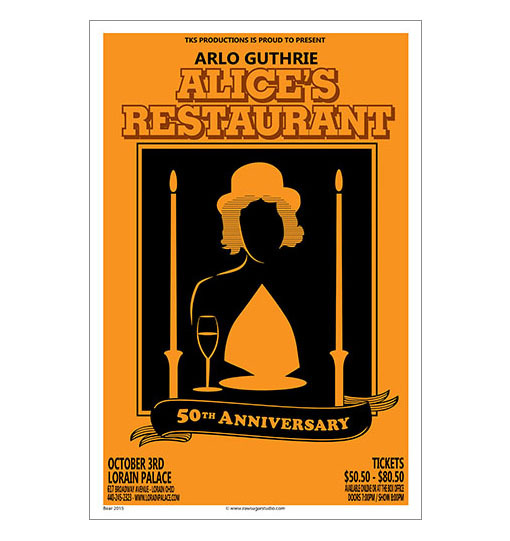 Arlo Guthrie Presents “The Alice’s Restaurant 50th Anniversary Tour”. This entry was posted in Concerts and tagged 2015, Arlo Guthrie, Kent Stage, Lorain Palace, rawsugarstudio.